9am: Check into the five-star Merchant Hotel, which underwent a major extension at the end of last year to include a new spa and 38 new bedrooms, bringing it up to 64 in total. "The hotel is a wonderful place to stay, be pampered and made to feel extra special," says Dawn McCormick, owner of Aurora Events and Marketing. 10am: Kick off the main meeting in one of the hotel's six event rooms, the largest of which holds 150. Organisers are able to increase oxygen levels in the rooms by 30 per cent and use adjustable colour lighting to keep delegates focused. 1pm: Up to 80 guests can be wined and dined in the hotel's landscaped roof garden with views of the two major hills overlooking Belfast. 3pm: Shake off the afternoon energy slump by taking a black-cab tour of the sites. It is a good opportunity to see Belfast's political hot spots, including the famous murals on the Shankill and the Falls roads. "Belfast is really alive and buzzing now," says Creative Events director John Barbour-McMullen. "Conference delegates are amazed at the diversity of things to do here and wish they had more time to explore the city." 7pm: Meet at Bert's, the Merchant Hotel's new jazz bar, for pre-dinner cocktails while soaking up the elegance of the art deco era. 8.30pm: Visit the equally elegant Deanes at Queens. The head chef, Chris Fearon, was one of only four winners in this year's cookery TV show, Great British Menu. Private rooms hold up to 40. 10am: Head to the Belfast Cookery School, which opened in July. The school has six individual cooking stations, so groups can cook in teams, pairs or individually. It hosts half-day sessions in which delegates can eat their creations. "Corporate cookery is a fun and engaging way of learning new skills," says Accomplished Events director Jenny Pink. 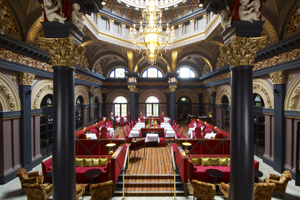 2pm: Capitalise on the food experience with a final meeting back at the hotel. 4.30pm: Give delegates a history lesson, by visiting the Titanic Exhibition Centre, which is due to open in April 2012 for the ship's 100th anniversary. Alternatively, jump on a boat with Lagan Boat Company, to discover the shipyards and history of where the Titanic was built. The company has two boats that can be hired - one for 35 and the other for 70. 7.30pm: Afterwards, guests can head to the fifth or sixth floors of the Titanic Exhibition Centre for a gala dinner. The largest room can hold 1,000. The Titanic Suite is based on the interiors of the ship itself for an eerie touch. 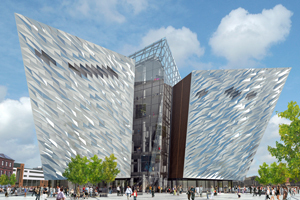 "Belfast provides groups with a dazzling array of Titanic experiences, from visiting the shipyard to holding a meeting or gala dinner in the new exhibition centre," says McCormick.